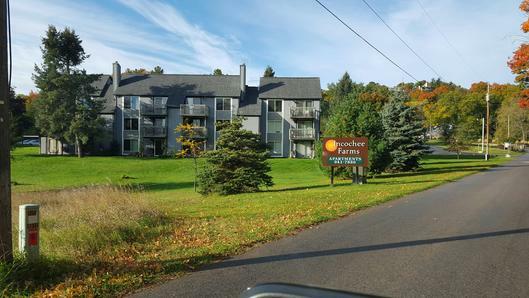 Located in Traverse City on Ramsdell Street, only a few blocks from beautiful West Grand Traverse Bay, INCOCHEE FARMS offers the following amenities for your safety, comfort and convenience. churches and the TART Trail (a walking/bicycle trail). Included in rent: Hot water, baseboard heat, city water, carport and trash pick up. Private laundry/storage room, immediately adjacent to your apartment, with hookups for your washer and dryer or you may rent them from us. Dishwasher, refrigerator, garbage disposal, and self-cleaning oven/range. Washer and Dryer, $36 per month. Storage locker, $35 per month. Pets, $36 per month for each pet. Limit 1 dog, 2 cats. 2019 Rents starting at $1115 a month, electric not included.